For the latest addition to our size? Exclusive Archive collection, adidas Originals present the new Gazelle Indoor in a deep ‘Indigo’ suede. The Gazelle has maintained it’s strong identity as a cultural icon since it’s first introduction as a lightweight training shoe in 1966, and not undergone too many abstract transformations across this whole period. After this a recent bring back of the classic shape in 2016, there have been a series of great new colour additions and collaborations to keep it’s identity refreshed. With it’s clean, no-nonsense profile, the uppers have traditionally been produced in suede, with leather accents used on the stripes and rear heeltab. The leather tongue will always be branded with the iconic trefoil, with subtly embossed three stripe details present throughout. A standout feature of the Gazelle Indoor it’s differing midsole, a sometimes translucent unit that drops the traditional hexagonal outsole texture in place of a combination of trefoils and suction cups, a feature commonly found on similar indoor training shoes during the 60’s and 70’s. 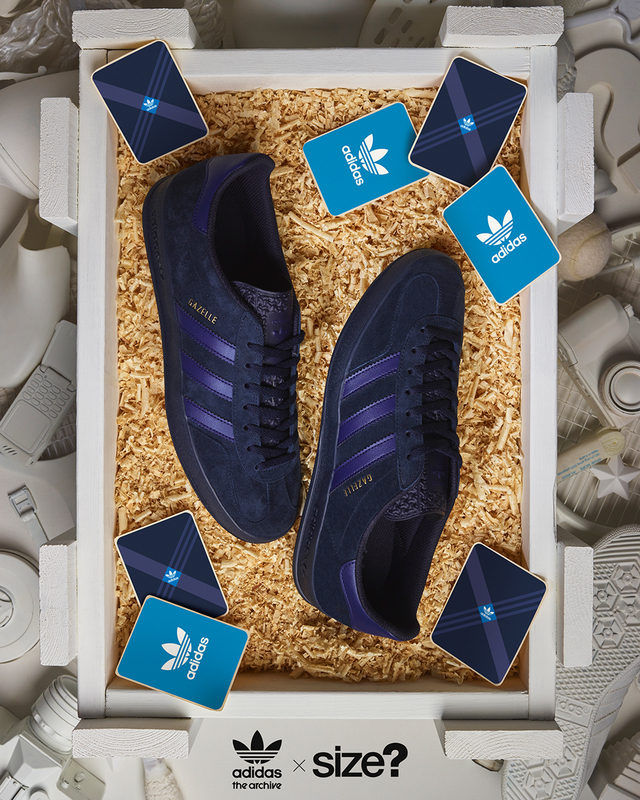 Our latest exclusive version dips the Gazelle Indoor in ‘Indigo’ for a premium suede treatment, carrying the deep colour over onto the midsole unit and interior. Dark navy leather stripes sit on top alongside gold debossed ‘Gazelle’ branding. The size? Exclusive adidas Originals Gazelle Indoor ‘Indigo’ will be available via the size? previews App and in all size? stores on Saturday 6th October, priced at £85. Take a look at an interview with Gary Watson, the man behind the archive visuals.